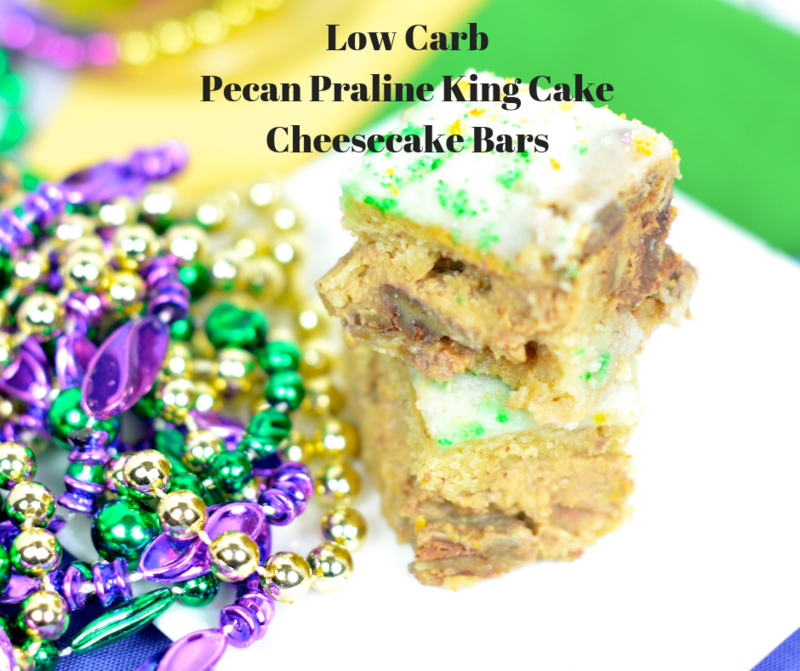 An easy low carb, gluten free pecan praline king cake cheesecake bar recipe with simple, pantry friendly ingredients. Amazing for all of our carnival celebrations. 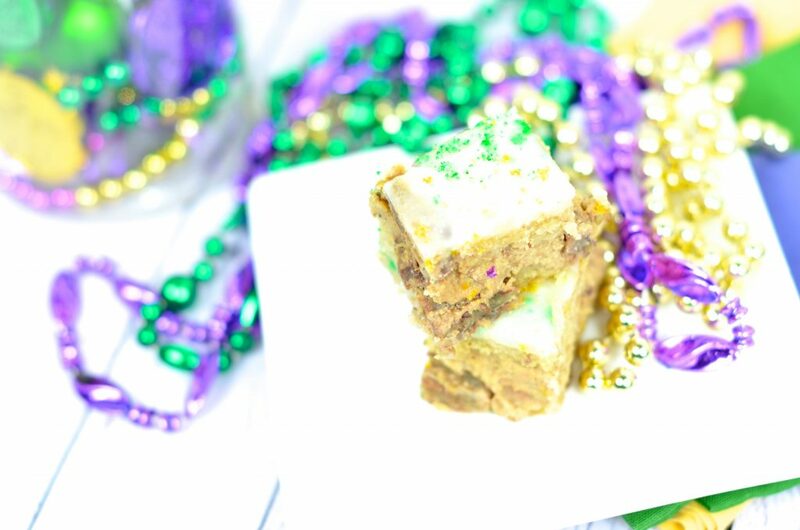 Mardi Gras 2019 schedules have been released, our calendars are booked with events, and it’s time to eat some King Cake! 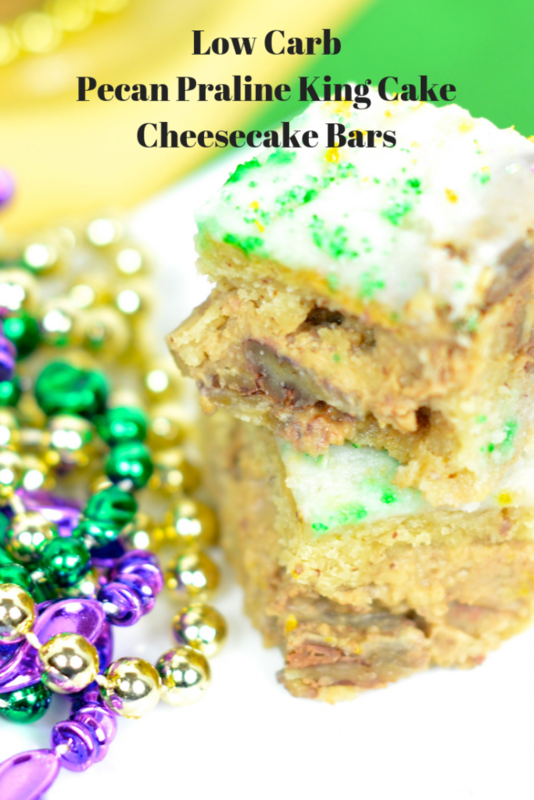 In my last post of Low Carb King Cake Cheesecake Bars, I posed the question, ‘When and where were you when you had your first slice of king cake?’ For many of us, the first slice is long before we can remember (hello diapers) and for others not so much. Remember, the Skinny Louisiana house is a split house of Cajun vs. Yankee. My Yankee husband (he insist he is from the midwest) traveled down to my hometown of Houma and tasted the fabulous Canatta’s King Cake! And his love affair with the king cake was born. 15 years and 2 kids later, they (as in my 2 kids) are searching for the yummy green, purple, and gold cake, and it’s an open playing field. We have amazing locations willing to ship (thank you Randazzo king cakes) to satisfy folks all over the country with this fun Mardi Gras tradition. Now, let’s pose the where question! Where were you when you had your first slice of king cake? Were you at home? Maw Maw’s house? Or right before the parade? I can always remember having king cake before and after the Krewe of Aphrodite in Houma. I remember this since my mom and several family members belonged to this krewe and while they rode, I enjoyed the king cake! From good times to present (yes, I am still having good times), I am busy at my drawing board continuing to develop king cake goodies. 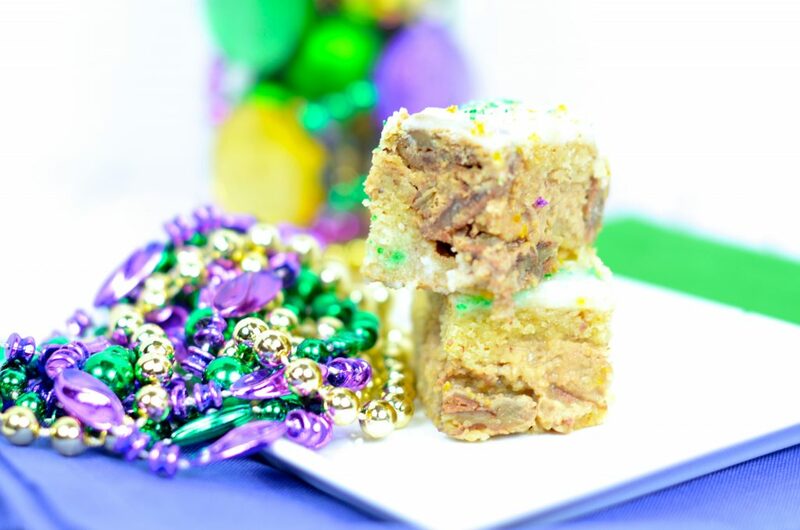 From my Low Net Carb King Cake Bread Pudding to my Low Carb King Cake Cheesecake Bars the Krewe of Skinny Louisiana is taking over the Mardi Gras 2019 parade schedule. 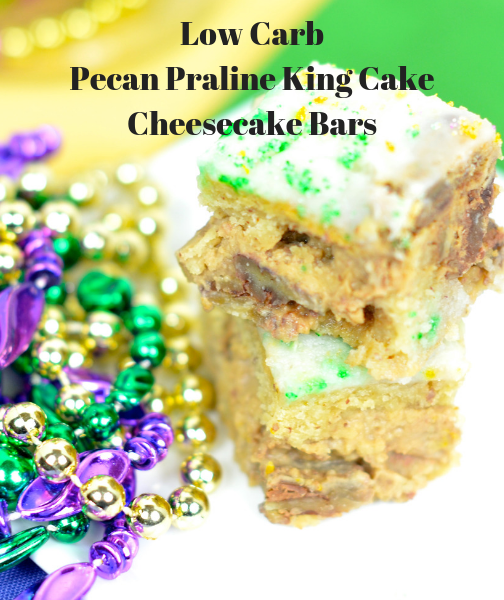 I posted the question on the Skinny Louisiana Facebook Group, ‘What king cake filling is your favorite?’ Searching through the amazing responses, the pecan praline stood out! I love King Cake. I love pecan pralines. Having a pecan praline filling? Let’s go for it! From pecan praline ice cream, to pecan praline cake, this is a huge find in Louisiana kitchens. And while I don’t have the secret Paula Dean peace pralines recipe, this recipe will make her just as happy. I hope you will love it just as much as my family does. ‘Shelly, my store does not carry these products? What do I do! Help!’ I understand. Many of you know my love of Drug Emporium stores. Not only does Drug Emporium have amazing prices (often the cheapest in town), I work with this amazing company in putting on Low Carb Food Demonstrations and product selection for shelves. All my items in the recipes are from Drug Emporium. For a full list of Drug Emporium store locations, click here. No Drug Emporium in your town? No worries, I have the links for where to purchase online! Not all nuts are created equal! I am thrilled to report our amazing Louisiana pecans are a low carb nut. 1 ounce of pecans has approximately 3.8 grams of carbs, while our friend the cashew has 8.5 grams of carbs. Stick with this nut in your king cake desserts. Steps of Pecan Praline Cheesecake Layers. In a small saucepan, melt butter. Stir in Swerve brown sugar, vanilla, and cinnamon. Combine. Remove from heat. Let cool for 5 minutes and stir in light cream cheese. Place to the side. Preheat oven to 325. Line 8 x 8 pan with non-stick aluminum foil. Spray with non-stick cooking spray. Using a spatula, scoop 1/2 flour mixture and spread in pan. Layer with cream cheese. Layer with remaining almond flour mixture. Bake in oven for 35-45 minutes or until set. Remove from oven and cool. In a small saucepan over low heat, melt butter. Stir in Swerve brown sugar replacer, vanilla, and cinnamon. Stir until combined. Remove from heat. Let cool for 5 minutes. Stir in cream cheese until combined. Layer 1/2 flour mixture, pecan praline cream cheese mixture, and 1/2 flour mixture in pan. Place in oven and bake for 40-50 minutes OR until set. Calories: 200. Fat: 18g. Saturated fat: 4g. Cholesterol: 35mg. Sodium: 25mg. Carbohydrate: 5g. Fiber: 3 g. Sugar: 2g. Protein: 6g.